Gunung Batu Putih is the 8th highest peak in Peninsula Malaysia (West Malaysia) standing at 6,993 ft (2,131 m) above sea level. So after conquering the G7 mountains (mountain peaks above 7,000 ft) next will the the G10 (10 highest mountain). It is situated in the state of Perak-Pahang border. Our meeting point at 8.30am on 24th April 2009 at Tapah Toll exit. We had to wake up at 5.00 am (something most of us dread doing) and sleeping around at 2.30 am the night before was no help either. Our sub-group of four that is Michael Lim, Wong Hok Mew, KC and myself was going to meet the rest of the group of 18. Our spirits were with high expectations and in the best shape, enjoyed our breakfast at Sungai Chua New Village, Kajang. 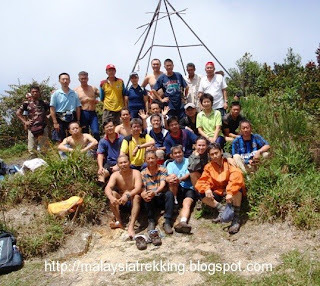 Gunung Batu Putih trail starts at Kuala Woh Recreation which is about 10km from Tapah along the Tapah road to Cameron Highland. 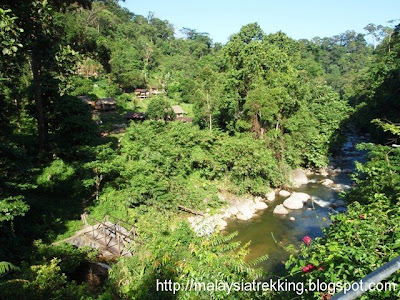 As we pass Kuala Woh Recreation there is a road passing the Kuala Woh Dam and along the way you can see modern looking Orang Asli huts (houses) on both sides that finally ends with a signboard that says Bukit Tapah Forest Reserve. There were about 9 cars which about occupies all available parking space and of course the very reasonable parking fees to ensure your vehicle's safety. As we assemble our backpacks (which was already pack), the four of us had decided to engage a orang asli porter (RM300 for 3 days). We provided a 55+10L backpack and put our food ration and cooking utensils weighing a total of 15 kg. The porters clothing would be around 4-5 kg. 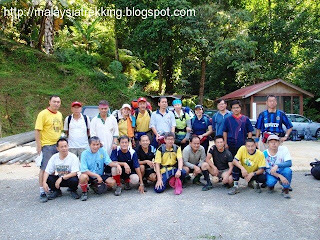 Our group size is 22 climbers, 4 orang asli porters and Chin Man our chief guide. 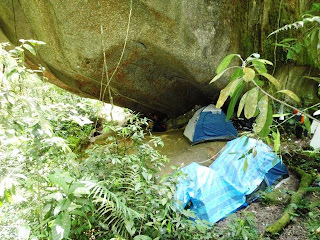 Chin Man says that it was not necessary to carry tents as they could sleep under the big boulder with overhanging canopy and enough space for everyone. Well, we brought our tents as we felt more comfortable. All the necessary paper work was done by Chin Man and a group photo before the climb. Day 1, we started at 9.45am taking the trail just behind the guard house. The trail followed the river and occasionally moving inwards and then back to the river, after an hour of trekking we arrive at the river crossing which requires most trekkers to get their feet wet. I beg to differ and remove my shoes and socks and move up river and tried crossing by jumping from rock to rock. Almost! Almost but alas! still wet my feet as all rocks towards the other side were under water. And by the way be prepare for leeches (our buddies for all Gunung treks). The river here has crystal clear water and everyone made up their mind to swim here on the way back. The height here is around 1000 ft above sea level and once after this point we started trekking upwards gradually passing by streams taking short 2-5 mins break before stopping for lunch around 12.30 pm at a stream which is the source for our drinking water. 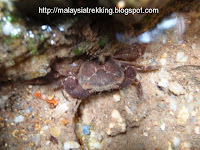 This is where I noticed a mountain crab swimming in the stream. I wonder whats a crab doing up here in the mountains. We took snack bars for lunch while other climbing mates took the rice dumplings (bak chang). After this stop its steep upwards to our campsite at 3600 ft. With a 12-15 kg backpack and rice dumpling with all the tireless effort trekking the steep terrain gonna' give you indigestion. This trip was a bit relax because the four of us shared a porter lightening our loads by 3.5 kg. When we approach the campsite at around 3.30pm you suddenly notice there is big boulder with empty spaces beneath. This boulder with the canopy reminds me of the Sepang F1 Grand Stand. The first thing is to search for a suitable place to set the tents and cooking area. The cooking area is the entrance to a long and narrow hole that looks like a torpedo launch site. Our tent site area is a bit uneven but manageable. Our source of water is a minute wal k down below where water gushers out from the rock. The water is icy cool and it tastes better than any mineral water. KC cook a quick meal of teh'o'and instant noodle, somehow up here everything tasted delicious. Dinner was served at 7.00pm with pre fried chicken, mixed vegetable soup and fried eggs. Since it was the first night we decided to tuck in early around 8.30pm, something difficult doing at home. Day 2, woke up around 7.00am, KC shouted what happened to our 2 jumbo loaf of bread. 1 was missing and another with the top torn opened. Very hungry jungle rats ate our breakfast and lunch and 2 sticks of candles, mmm.... rats! Well not to be alarmed, usually we would pack an extra day of food. Todays climb 1st hour very steep then gradual, then steep again, then gradual then some climbing. Just pack about 1.5 litre of water and some lunch snacks for trek to the peak which will take about 4 hours. We started at 8.30am, rest at the botak hill (usually most gunung will have a botak hill) and a view of mountainous surrounding with Gunung Batu Putih within sight. Estimated to the peak less than 2 hours. The trek up pass by mossy forest and some areas with strong winds makes it cold. Just trek at a steady pace, those at the front would lay some papers marking the trail, we usually try to walk in two's or three's for safety and conversation. Reach peak at 11.45am and a tri-post marking Gunung Batu Putih, clear skies and beautiful weather. We spend about an hour on food, photos and to enjoyed the surroundings. Descended after 12.45pm, reach the campsite around 3.00pm. The descend is always faster than the ascend. Took our bath and rested till dinner time. After dinner we just lazed around looking out into the dark jungle and listened to the Gunung Batu Putih Philharmonic Orchestra performing continously till morning. Our thoughts on how lucky we here, to be able to enjoyed nature as it intended to be, no tv, no handphones, no radio and not going anywhere. The creatures of the night played many tunes somtimes to a roar and sometimes to soothing sound of flute, I wondered thats how Mozart, Bach and others must have got their inspiration for their classical pieces. Day 3, after breakfast, pack up and left Gunung Batu Putih with good memories of a good climb and relax atmosphere Trekking at a steady pace we reach the guard house at around 12.00pm. Some came later as they were swimming at the crystal clear water. Lunch at Sungkai famous salted chicken. And yeah with body aches and pain to go. Such a Great Blog and information. Well done. It help traveler lots. Thank you so much.